The easy way into the first showing of classic trawler yachts on Seattle&apos;s Lake Union simply was to walk in. That&apos;s the way most visitors came. I took a different route by helping deliver a 65-foot Romsdal North Sea trawler from its home port in Roche Harbor, on San Juan Island, to the show on the edge of Seattle&apos;s central business district. All was calm, although occasionally drizzly, on the weekend of the first showing of fine old wood vessels by the Classic Trawler Yachts Network and the Center for Wooden Boats. On the route across the Strait of Juan de Fuca a few days earlier, Viking Fjord encountered moderate swells rolling in from the Pacific Ocean to the west. The passage into Puget Sound, with Point No Point on the beam, was lumpy and wet, as a southerly wind estimated at 30 knots howled over the flood tide. The wood boat, built in Norway in about 1960, creaked and groaned as she rolled in the swells and slammed into the sharp seas. All we had to do was hold on and ride it out. She was one of six classic wood boats that turned out for the show at the Center for Wooden Boats on Seattle&apos;s Lake Union. The sailing ship Wawona, which long ago retired as a codfish schooner, is the showstopper at the center, but smaller finely crafted wood boats also line its docks regularly. On this April weekend, however, the classics shared the limelight. Joyce Gauthier, a Seattle-area physician and owner of Ursa Major, a 65-foot Malahide partly built in Norway and finished in Ireland, and Dennis Phethean, an Australian who works for a government agency far from the sea, created the network (www.classictrawlers.net) to locate and celebrate the Malahide and Romsdal yachts. It is primarily a research and information website. Gauthier, who operates Ursa Major as a charter yacht in southeast Alaska in the summer, put together the classic show and found support from a group of waterfront businesses. Phethean flew in to see the boats he describes with love on the website he manages. Another visitor was Myles Stapleton, of Malahide, an oceanfront neighborhood in Dublin, Ireland. He designed the fleet of Malahide yachts built in the early 1970s. Lining the center&apos;s mooring float with Viking Fjord were Ursa Major; Explorer, a 60-foot Malahide; Sea Quest, a 65-foot Romsdal; Beagle II, a 58-foot pilothouse trawler designed by Bill Garden; and Argo, a 48-foot Santa Barbara by Ed Monk built in California in 1964. Simply because she was the oldest-and fresh from what was described as a $700,000 refurbishing- Beagle II drew admiring visitors. Launched in 1951 by Fellows & Stewart in San Pedro, California, she spent many years as a traveling dental clinic in Alaska. As designed by Garden, a former Seattle naval architect who now lives on a small island in British Columbia, she carried sails on two masts. The masts remain, but the sails are gone. She originally was powered by twin 3-71 Detroit Diesels. Today, two Lugger diesels occupy the white and brilliantly lighted engine room. Like all of her sister classics, Beagle II is a deep draft yacht (6 feet 6 inches), and stairways are more like ladders. Some of the spaces belowdecks are cramped, and the staterooms are equipped only with bunks. Garden described her as "an excellent sea boat with great range and capacity." She&apos;s beautiful, too. Readers of PMM will recognize Ursa Major and Explorer, another Malahide charter yacht, owned by Richard Friedman of Bellingham, Washington. Both were featured in two articles about Malahide yachts. (See "Wilderness Adventure" PMM Feb. &apos;02 and "A True Trawler Yacht" PMM April &apos;02.) Although they are more than 30 years old, both are in good original condition. Sea Quest also is fresh from an extensive rebuild that I suspect has her looking better than the day she was launched. Her new liveaboard owners, Bill and Betsy Ann Wood, of Massachusetts, plan a world cruise. Romsdal builders must have been paranoid about getting home safely. Their boats are fitted with two engines but only one propeller shaft. An array of shift levers in the engine room connects one engine-but only one at a time-to the shaft. Other levers in the pilothouse engage the drive that uses 10 belts to transmit engine power to the shaft and permit shifting from forward into reverse. Compounding the complexity, Viking Fjord and other Romsdals also are fitted with variablepitch propellers. Sea Quest &apos;s previous owners tossed all of that and installed one new engine, a 272hp Volvo, and a standard Twin Disc marine transmission. Viking Fjord has the original stuff, including an old Volvo diesel, which is the standby engine, and a Lugger, the main propulsion engine. Bill Wood bought Sea Quest after she was rebuilt by a previous owner at a cost of about $1.3 million. He was interested in seeing Viking Fjord, which has never been through a major overhaul, to determine what equipment and fittings on his boat are original Romsdal and which are not. Both have been modified, but not extensively. Some earlier owner gave Viking Fjord a full-width picture window in the after wall of the saloon. It&apos;s a nice feature, but one its Norwegian builders never considered. 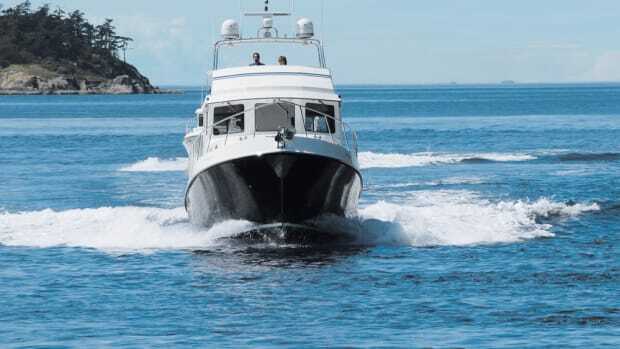 Argo was the only classic without a raised pilothouse. She&apos;s owned by Ron Miller, a retired Navy chief petty officer and holder of a Coast Guard 100-ton license. An experienced delivery captain, he also skippers Ursa Major during the summer. Argo is strip planked with Honduras mahogany, over white oak frames. Originally equipped with a 300hp Cummins V8 diesel, she has been repowered with a 170hp 6V53 Detroit Diesel. Miller has owned her since 1993. Despite his busy work schedule, he has cruised the boat extensively in the Northwest and southeast Alaska. The owner of Viking Fjord was willing to show his boat but was unable to deliver it to Seattle. Gauthier rounded up Miller and asked me to help. I jumped aboard a ferry for the San Juan Islands at 6:10 a.m. Stapleton also signed on and flew to the boat from Seattle. We provisioned for a long day (80 nautical miles) at sea (bread, lunch meat, lettuce and mayo) at a store in Friday Harbor, collected Stapleton at the airport and drove north to Roche Harbor. The double-ended Romsdal design is distinctive and easy to identify. If you&apos;re unsure, however, the most obvious hallmark may be the face of the Portuguese bridge. In most cases the vertical boards with which it is finished are varnished, creating a shining image that can be seen for miles. Miller already had been aboard and had talked with her owner several times. We stowed breakables and began disconnecting power and telephone lines while Miller started the Lugger. We explored the boat, too, quickly checking out the galley and saloon on the main deck. We scaled the ladder that runs from the side of the galley to the pilothouse and then followed a steep stairway to the staterooms, heads and engine room below the main deck. The depth and angle of the hull belowdecks dictate the shape of spaces. The master stateroom offers good elbowroom, but other sleeping areas have stacked bunks, and in one head the marine toilet is set into the angled slope of the hull. Small, dark spaces abound. One sort of slithers through a small shop on Sea Quest to find the door to the engine room. My wife and I have two cats as crewmates on our boat, and they frequently disappear into dark corners for many hours. I imagined they might get lost for days in the bowels of a Romsdal. The owner said we might need to top off the hydraulic steering reservoir. A good warning. There was no oil showing in the sight glass, and we spun the wheel dozens of times in each direction and the rudder never budged. We began pouring in "tractor oil" and working the wheel. After nearly a gallon of oil and hundreds of turns, the rudder functioned normally-as it did all the way to Seattle. It would have been so simple to back away from the slip and discover we had no steering. The owner&apos;s warning and Miller&apos;s experience prevented that kind of catastrophe. With a draft of 10 feet, we couldn&apos;t take the Mosquito Pass shortcut to Haro Strait from Roche Harbor, so Miller steered out Spieden Channel across the top of Henry Island and into the strait. The Coast Guard was waiting for us on Channel 16. Miller identified the yacht and himself to the calling buoy tender, reporting we were bound for Seattle. We were not boarded. 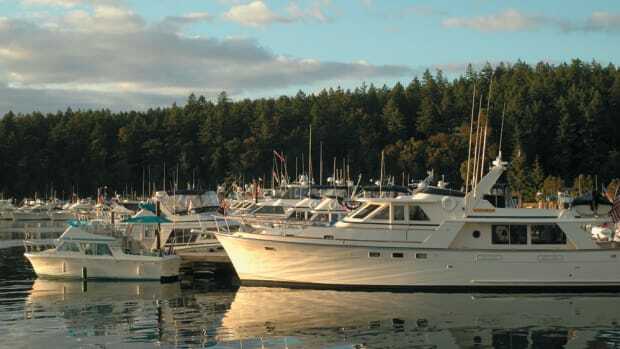 We could hear the cutter contacting other vessels by radio, and I wondered at the impossibility of doing those security checks during the peak of the summer cruising season, when that water is crowded with pleasure boats and commercial craft bound to and from British Columbia. We told Stapleton we might see a pod of orca whales along the west shore of San Juan Island, but we didn&apos;t. As compensation, however, a team of Dall&apos;s porpoises (which look like miniature orcas) raced with us (no contest, either) and flashed across the bow for several minutes. By the time we reached the south end of San Juan Island, Viking Fjord began to roll, as swells in the Strait of Juan de Fuca hit her on the starboard beam. I took the helm about halfway across, and that at least gave me something to hang onto as the swells grew and the old boat rolled one way and then the other. Compared to the semi-displacement yachts that I know, which roll, stop short and then snap back upright, this was slow motion. There was never any suggestion that the yacht was impressed by the size of the swells. She just kept plugging along and no doubt would have continued doing that for as long as necessary. But, oh, one did need to hang on. Viking Fjord has paravane stabilizers, but no one suggested deploying them. We didn&apos;t know the system, and the strait crossing of about 20 nautical miles takes a little more than two hours. Myles and I did go out onto the bridge deck to lash down the dinghy davit, which was swinging as the yacht rolled, lifting and tugging at the aluminum tender. An antenna insulator was loose and scraping across the top of the pilothouse. Myles could see it whipping about but could do nothing to secure it. To me, the 65-footer seemed a bit sluggish in responding to the helm. That may have been because of her size, or simply how I reacted to handling a yacht many feet and tons larger than my 42 Grand Banks. Ron found her difficult to handle while he backed out of the Roche Harbor moorage and maneuvered for a landing in Seattle later. Once inside Admiralty Inlet, running toward Marrowstone Island, Myles went below and made a plate full of sandwiches and opened a bag of chips. Lacking liquid refreshment, he raided the owner&apos;s refrigerator and found a Rainier beer and a large bottle of Coke. The wet, chilly weather reminded Myles that he helped deliver partly complete Malahide yachts from Norway to Ireland more than 30 years ago. There was a deckhouse, but it was empty inside. There were no operating systems other than the engine. To keep warm while they slept on the course across the North Sea, the crew curled up on the floor of the engine room. At Point No Point we began riding a hobbyhorse as the incoming flood met brisk southerly winds. I found it impossible to stand on the pilothouse deck, behind the Portuguese bridge, while trying to photograph seas breaking over the bow. We watched as the canvas cover on the hydraulic windlass struggled to sail away in the near-gale wind. No one offered to go forward to save it, but one stubborn tether held tight and the cover stayed with us. Viking Fjord paid no heed to the gusts. She just kept going south, spray flying wildly, and soon we were in the calm waters of Shilshole Bay, then through the Ballard Locks and alongside our slip at the Center for Wooden Boats. Days later, I talked with Bill Wood. He had taken his big yacht to Port Townsend after the classic yacht show for some work before heading south along the West Coast. "At Port Townsend we encountered constant winds of 45 knots, gusting to 60," he said. "We bounced and rolled and I was looking for my seat belt, but we had no problems." Although there were three of us aboard Viking Fjord for the one-day delivery, Bill and Betsy Ann plan to handle Sea Quest themselves on coastal routes. For ocean crossings, however, they will add one more seaman to their crew. "I have been looking at North Sea fishing trawlers since the 1960s," Bill added. "I was in the merchant marine and worked on tankers and freighters. I wanted a cruiser that looked salty, had a deep draft-a lot of weight down low." When we talked, Bill said their destination was the East Coast. They hadn&apos;t decided, however, whether they would travel east through the Panama Canal or turn west for the long jog around the world via Australia and New Zealand. The Romsdal may have been the first production trawler yacht when she was introduced in the late 1950s. Her design, borrowed from fishing vessel lines, certainly influenced others, including the creators of the Nordhavn family of yachts. The Malahides drawn by Stapleton have a similar raised pilothouse, set well aft, and an expansive foredeck. On fishing vessels that deck was crowded with nets and other gear and hatches opened onto fish holds. Today, on yacht versions, one is likely to find tenders or racks of kayaks in that grand open space. For the most part, the old-timers bear small resemblance to the boats we today call trawlers. Their size and weight and their vertical design- with ladders rather than stairways-probably would not be wildly popular in today&apos;s boating market. Those features, though, make them solid, safe sea boats-an attraction to many who know what ocean cruising is all about. It would be impossible to build a Malahide or Rosmdal of wood today, considering the scarcity of material and talent. Fiberglass doesn&apos;t seem right for reproducing those classic shapes. It would be great, I thought as I steered through the rolling swells of the Strait of Juan de Fuca, to use modern technology to build one today-with a steel hull, an aluminum house, one good engine, a thruster (perhaps) and with a little fiddling of the design to make it easier to move around and to make better use of the interior spaces. Dream on, Robert. But pay attention to this old boat! There was nothing dangerous in the little bumping around we experienced, but it was enough to make me confident that a Romsdal or Malahide would continue to do well in much worse circumstances. All one needs to do is hang on. Joyce maintains a practice as an arthritis specialist and works shifts in a hospital emergency room. She also is the principal historian for the classic yacht website and spends hours searching for information about Malahide and Romsdal yachts. And she manages the affairs of her Ursa Major charter operations. Despite all of that, she organized the Lake Union show and rounded up a large team of volunteers and sponsors who helped make it happen. She was pleased with the turnout of six vessels and a small crowd that walked the docks over the weekend and attended a series of lecture sessions and discussions about classic yachts, construction and great cruising adventures. So pleased, in fact, that she plans to do it again in April 2004.